Hey there crafty babes! My name is Jen Causey and I’m the resident wedding expert for Cricut. I’m the creative gal behind the wedding blog called Something Turquoise and I use the Slice and Weld tools ALL THE TIME when I’m working in Design Space… so I figured I should share my best tips for using these two valuable tools. 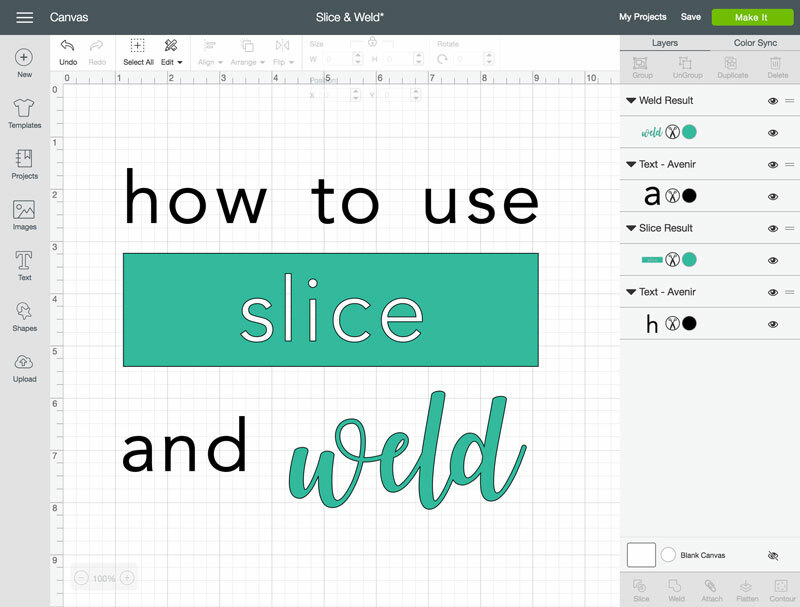 Whether you’re looking to connect script style fonts or remove unwanted pieces of a shape - slice and weld are for you! The Slice tool splits two overlapping images or text into different parts. Slice creates new cut paths from two images, resulting in three or more completely new shapes! Each of the new shapes will show up in the Layers panel as an individual layer, that you can keep or discard. The Weld tool allows you to join shapes to create a single customized image by removing any overlapping cut lines. This can be a great way to simplify a design, keep the letters of a word connected, or combine shapes to create new designs! If you are working with multi-layered images, you may want to ungroup the layers to arrange them separately before welding. Once you select one or more layers, the weld tool will become active. You will know that your images are welded when they change to the same color and the new image appears in the Layers panel. I hope you enjoyed this quick video and I hope it has inspired you to get ultra creative and slice or weld something of your own! Make sure to follow us on Instagram and Pinterest! Sure, you can make stencils with the results. You can use regular removable vinyl or cut stencil material for a more permanent option. What font is that Hello in? I love it. Thanks for tutorial! Hi. It’s a font called Watermelon Script. You could install it on your computer, then use as a system font. If you are doing a card but where the score line is you want to cut then delete that piece (back piece of card) how do you do this??? Hi. You could try changing that line from scoring to cutting in the Layers panel on the right. Hey, what font did you use for the hello? Hello is made using a font called Watermelon Script. You can see the terms for use and download it here: https://www.dafont.com/watermelon-script.font Once you have it installed on your computer, it should show up in your font list. Thanks for a great tutorial- clear, descriptive, and useful!!! This was so helpful!!!! Thank you for the easy to understand explanations! After you weld letters together I noticed that the “font name” is no longer available. Is it possible to tell what font you used for the welded word “after” it has been welded. This tip would be helpful if you want to make another page using this same font but can’t seem to find it in the list anymore. Thank you.